Understanding the potential changes in waves under global climate change is critical to supporting coastal hazards and habitat studies, planning for infrastructure and resource protection, and bolstering resiliency and restoration efforts. 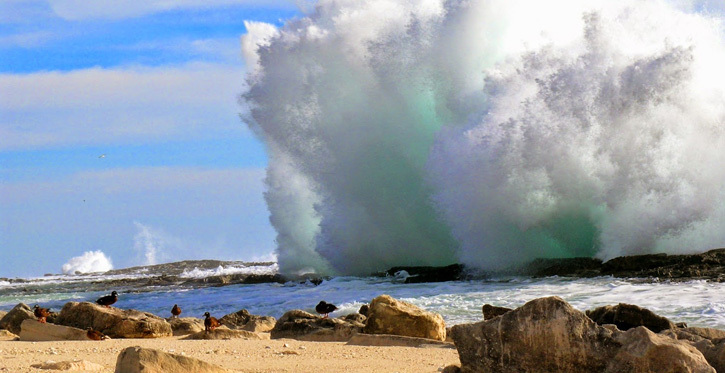 Processes driven by waves can result in overwash and flooding, potentially resulting in damage to coastal infrastructure and other natural and cultural resources. In this webinar, Dr. Storlazzi will be discussing research that used global climate models to examine the projected changes in wave heights, wave periods, and wave direction for the Main Hawaiian Islands and 22 other U.S.-affiliated islands in the Pacific Ocean. Modeling results project that wave behavior will change over time throughout the century, but will also demonstrate change over certain seasons within each year. The data discussed will be useful in planning for coastal resilience and ecosystem protection, preparing for resource impacts, and designing future infrastructure. Dr. Storlazzi is a research oceanographer and Chief Scientist of the USGS Pacific Coral Reef Project and USGS Sea-level Rise and Climate-Change Impacts to US Department of Defense Facilities on Pacific Atolls Project. He actively conducts geologic and oceanographic research on coasts and continental margins of the US, specializing in coastal hydrodynamics and sediment transport. He presently leads a research team of 21 PhD researchers and 24 operational staff examining the geologic and oceanographic processes that affect the sustainability of US Pacific coral reefs and reef-lined islands. Dr. Storlazzi is the author or co-author of more than 80 scientific papers, report, and books; since 2010, Dr. Storlazzi has worked with 37 PhD researchers at 15 different institutions and advised 10 postdoctoral researchers and graduate students.